A heat advisory is in effect for the D.C. area as temperatures are expected to reach the 90s and heat index could get up to 105. That could create some dangerous conditions. Here's what you need to know. WASHINGTON — Summer doesn’t officially start until June 21, but it will feel like summer is in full swing in the D.C. area on Monday and Tuesday with the heat index climbing over 100 degrees in some areas. 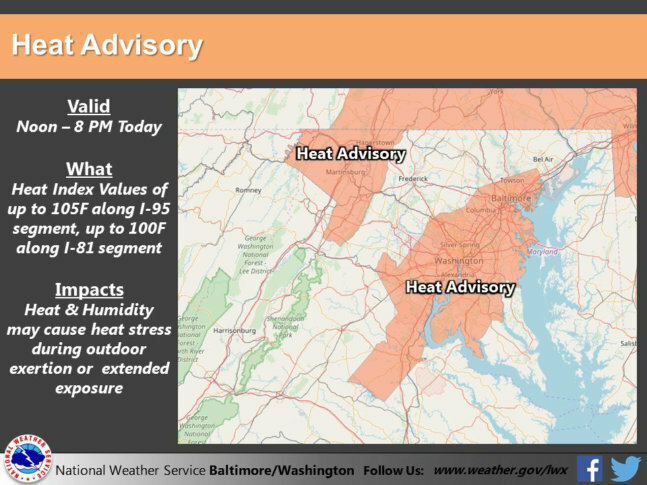 The National Weather Service has issued a heat advisory for the D.C. area until 8 p.m. Monday. A heat advisory means that a period of high temperatures is expected. In anticipation of the high temperatures, D.C. Mayor Muriel Bowser has activated the Heat Emergency Plan. When the temperature or heat index in the District reaches 95 degrees, D.C.’s Department of Human Services and the Homeland Security and Emergency Management Agency will activate cooling centers for residents to seek relief. Due to high temperatures, low-barrier shelters will be open all day on Monday with the exception of the Nativity Shelter, which opens at 7 p.m. Families seeking emergency shelter can call the DC Shelter Hotline at (202) 399-7093 or 311 at any time day or night. When temperatures get this high, it’s not just unpleasant, it’s potentially dangerous. The Centers for Disease Control and Prevention has specific recommendations for the symptoms of heat exhaustion and the even-more-serious heat stroke. Under those circumstances, you should move to a cooler location, loosen your clothes, lie down, apply wet, cool cloth to as much of your body as possible and sip water. If you continue to vomit, seek medical help right away. Environmental departments in D.C., Virginia and Maryland have issued a Code Orange air quality alert for the area for Monday. This means that air pollution concentrations may become unhealthy for sensitive groups. It doesn’t appear that this stretch will be officially a heat wave, which is a stretch of three consecutive days above 90 degrees. Sunday’s recorded high at Reagan National Airport was one degree shy at 89 degrees. But Storm Team4 meteorologist Matt Ritter said that the temperature Monday and Tuesday will easily top 90 degrees and the heat index will be near 100 degrees. Records could be broken on both Monday and Tuesday, with temperatures in the 90s. 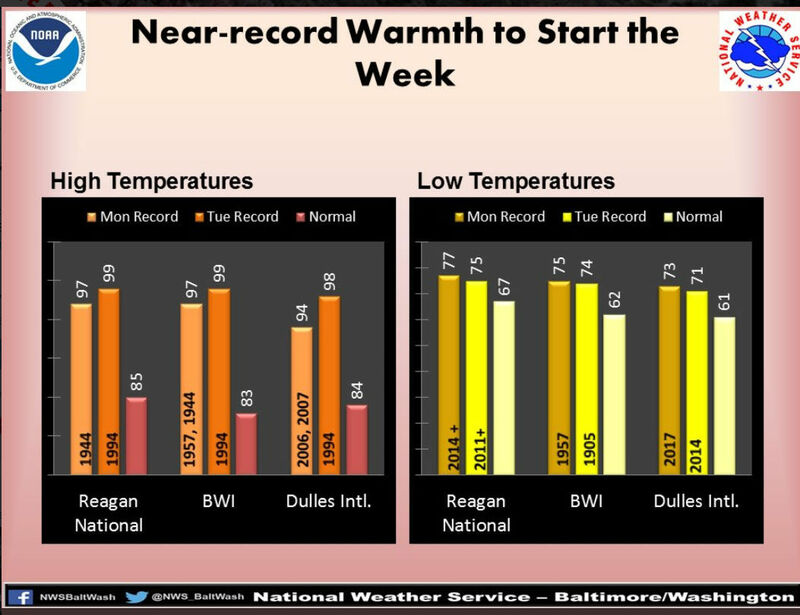 The record high for Reagan National Airport and BWI Marshall Airport for Monday is 97 degrees set in 1944 (and also in 1957 for BWI Marshall); and for Dulles International Airport, it was 94 degrees set in 2006 and 2007. As if the temperature wasn’t enough, the humidity will make it feel even hotter. There will be no relief on Tuesday, which could also break some records. Storm Team4’s Somara Theodore said temperatures will be a bit lower in the mid 90s. The record highs for June 19 are 99 degrees for Reagan National and BWI Marshall set in 1994; and 98 degrees for Dulles in 1994. Tuesday afternoon and evening could see some storms, which should bring cooler temperatures for the end of the week. Theodore said temperatures should get back to the 80s to end of the week, though the fhance for rain will go up in the weekend. Monday: Mostly sunny, humid. Highs in the mid to upper 90s. Heat index up to 105. It will be partly cloudy on Monday night with temperatures in the mid to upper 70s. Tuesday: Mostly sunny on Tuesday with highs in the low to mid 90s. The heat index will make it feel warmer than that. There is a chance of storms later in the day and over night. Wednesday: Partly sunny to mostly cloudy and highs near 90. There’s a chance for scattered thunderstorms. To get the latest weather forecast, go to WTOP’s Weather page.